Health Care Without Harm has eye-opening statistics on the environmental impact the healthcare industry has had on climate change. In fact, it was only a few decades ago that medical incineration was the most significant source of dioxin emissions in the United States, and was responsible for 10 percent of all mercury air emissions. 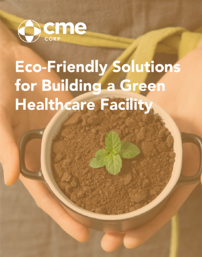 OUR EBOOK: ECO-FRIENDLY SOLUTIONS FOR BUILDING A GREEN HEALTHCARE FACILITY WILL PROVIDE AN INSIGHT ON REDUCING YOUR FACILITY'S WASTE STREAM, ECO-FRIENDLY REFRIGERATION AND ECO-FRIENDLY FURNISHINGS. In response to environmentally responsible initiatives, product manufacturers are encouraging their engineers and designers to “think green” as they create new product lines.